I have followed Forkish’s levain/starter process to the letter. What I have at day seven is a slurry with a few bubbles in it. I went ahead and made the starter for the pizza dough. Again, I have a sort of slurry with a few bubbles. The culture doesn’t smell bad, but it also has never risen. It’s “light” and “goopy” but it’s not rising. I made and kept Reinhart’s starter from THE BREAD BAKER’S APPRENTICE several years ago, and I had a similar problem. I thought it had utterly failed. I left it sitting on the counter for another day and...wham! I had a working starter. Should I start over? Should I feed the seven-day slurry, or just leave it till it does something? If your answer is “feed,” then what should I feed it? If it's goopy, you may have too much liquid -- my starter has the texture of wet clay. I wouldn't start over. If there is some yeasty smell and some bubbles, it means you are probably OK. I'd remove all the starter except for 2 tablespoons, then add 30g. flour mix (1/2 wheat 1/2 white) and 30g water. In about 8 hours, you should have some bubbles and smell a bit sweet, 24 hours, it should have risen and fallen and have a distinctly sour smell. Repeat each morning. Should be going good in 2 days maybe sooner. I'm afraid I'd disagree with removing a lot and adding fresh flour/water. Is a young starter, you want things to happen and it seems they are (slowly yes, but that's how it goes with a new starter). Removing a lot of what already has happened and adding a lot more food would only server to dilute things down (a lot). Kinda like 2 steps forward and 3 (or 4) steps backwards. Give it food, yes, but don't get rid of what you've been working for thus far. Things tend to go a lot quicker that way. Also, don't be afraid to thicken it up a bit. Doesn't hurt anything, and makes seeing the rise and fall much easier. I threw that batch out. I made another. I (think that I) successfully made Forkish's levain, then the starter for the levain pizza dough. But I didn't get to make the pizza dough, and instead I made Alexandra Stafford's Peasant Bread (that's a very nice recipe) and substituted the starter for the corresponding amounts of flour and water. I decreased the instant yeast from 2 1/4 tsp to 1, and used said starter. 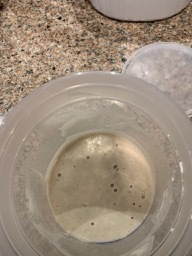 I've never once seen the starter rise, nor the levain it came from. This morning, I took 200 g of the levain from the fridge, and added 100g of water (85 degrees) and 100 g of gold medal unbleached all-purpose flour to the starter and put it in mo oven with the light on (It's cool is my house, between 68-70 degrees). 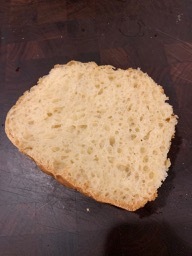 Is this an active levain? I'm asking because it is refusing to double, or even move, really. There's gluten in it; it's stringy. And it bubbles like that. Those bubbles were not there this morning. Am I on the right track with the oven light or not? My inclination is to let this levain that I fed this morning sit there, either on the counter or in the oven, until it doubles.